The Block Island Conservancy rallied more than 600 donors to preserve a portion of the Mitchell Farm with its classic rock fence. Vacationers spilling off the ferries from the mainland are soon transformed by the scale, pace and beauty of this place. Six miles long and three miles wide, many visitors take a holiday from the automobile and return to the simple pleasure of going everywhere by bicycle. Peddling a bike is the best way to appreciate the classic landscape of rugged shorelines, nature preserves and farm fields stitched together by ancient rock fences. The authenticity and charm of Block Island is largely the result of committed individuals and environmental organizations that have already succeeded in preserving more than 40 percent of the island’s land area. Most accounts identify Captain Rob Lewis as the preservation catalyst. Captain Lewis commanded Liberty ships during World War II and returned to Block Island to lead a quiet life as the proprietor of the island hardware store. But this unlikely environmental hero was stirred to act when “mainland developers” proposed a subdivision in Rodman’s Hollow. In 1972, Lewis formed the Block Island Conservancy, one of the first two land trusts in Rhode Island. Over the course of several years, the Conservancy and the Town Council cobbled together enough money to pay the would-be developers and Rodman’s Hollow became Block Island’s first preserve. The Rhode Island Department of Environmental Management identified preservation priorities on Block Island and proceeded to conjure funding through creative partnerships with landowners, the Block Island Conservancy, the Audubon Society, The Nature Conservancy, the Champlin Foundations, the U.S. Fish and Wildlife Service and the National Park Service. For example, David and Elise Lapham owned 140 acres at the north end of the island where they planted flowers and trees and created a tangle of trails known as “The Maze”. In the early 1980s, the Laphams donated a conservation easement to the state and The Nature Conservancy. The value of this easement was then used to match federal grants, generating funding for additional preservation on the island. Today, the Lapham’s property is managed by The Nature Conservancy as the Clay Head Preserve, one of five Nature Conservancy preserves on Block Island open to the public. Practically every resident of Block Island pitched in to save the Southeast Lighthouse, an 1875 brick landmark that would have tumbled into the ocean unless it was moved back from the eroding bluffs. 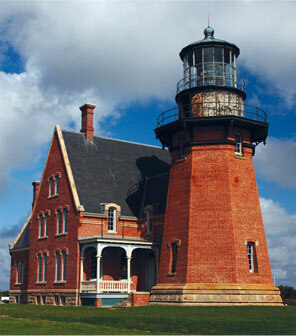 It took seven years to transfer ownership of the threatened structure from the U.S. Coast Guard to the Southeast Lighthouse Foundation. After that, the Town and the Foundation had to find the $2 million needed for relocation. The majority of the funding came from the State of Rhode Island, the Champlin Foundations and the federal government (through the leadership of U.S. Senator John Chafee). But a sizeable portion was raised, and the lighthouse safely moved, through the efforts of Block Island residents and businesses in a campaign led by Dr. Gerry Abbott and, again, Rob Lewis. Despite preservation successes and voter approval of a conservation bond, threats to the landscape mounted along with the popularity of Block Island for retirement and vacation homes. Keith Lewis, Rob’s son, personality shepherded an act through the state legislature allowing municipalities to impose a tax on real estate transfers to raise money for preservation. Town voters adopted a two-percent real estate transfer tax and also elected Keith Lewis to run the Block Island Land Trust, the Town agency that decides what properties will be protected with the tax proceeds. As of 2007, 43 percent of Block Island was permanently preserved. The real estate transfer tax has generated over $14 million and the Champlin Foundations have also contributed millions of dollars. But the dedication of The Nature Conservancy deserves additional recognition. According to articles in the Providence Journal by Peter Lord, in 1991, The Nature Conservancy named Block Island as one of the twelve “Last Great Places” in the Western Hemisphere. It has since acted on that observation by spending $44.6 million to help ensure that Block Island remains one of the last great places.